Costumes will be judged in a variety of categories. 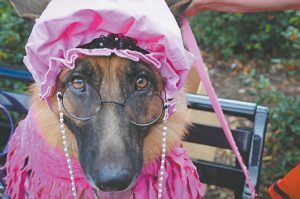 The seventh annual Bark Out Against Battering Pet Fest helps pets and their humans who have escaped domestic violence. Proceeds support a program of the YWCA of Greater Cincinnati and the SPCA-Cincinnati to find temporary homes for the pets of people who have escaped abusive relationships. Other sponsors for the event include Women Helping Women, Too Apparel and various local businesses. Bark Out Against Battering will feature a photo booth for pet and owner pictures, food trucks, 12 costume contest winners, pet trick-or-treating and more than 20 vendors. Not only is cruelty to animals frequently an indicator and predictor of interpersonal, family and community violence, but many women report that threats to their companion and farm animals prevent them from leaving abusive relationships. This event allows the YWCA Domestic Violence Shelter to further emphasize that connection.